It is easy to think of Jamaica’s history simply in terms of sugar and slavery and to forget its crucial role as a British military foothold in the Caribbean. Although tens of thousands of enslaved Africans worked to produce sugar, many were also made to work on military building projects in terrible conditions. From the beginning, with the conquest of the island when it was seized from the Spanish in 1655, the island was home to a transient military population. For most of the eighteenth century Britain was at war with Spain or France or both, as all sought to establish empires, search for gold and other treasure, and plant colonists for permanent settlement. 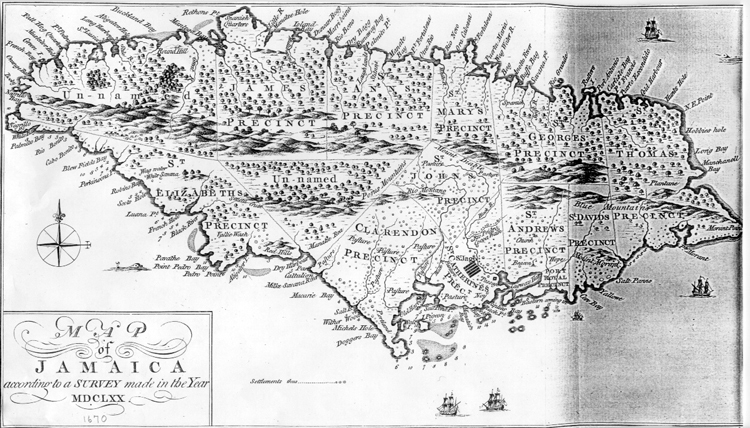 In the case of Jamaica the port of Kingston, with its huge natural harbour, also became one of the largest in the world for the slave trade, receiving enslaved Africans from the notorious Middle Passage and selling many on to Britain’s American colonies in the Carolinas, Virginia and further north, and also selling on into Central and South America. This was a valuable trade that required protection at sea, but although Jamaica did have her own Militia it also created a situation that from time to time threatened to erupt into rebellion,calling for additional military support on land. Those soldiers were housed in a variety of barracks and forts, the remains of which form a very significant part of Jamaica’s eighteenth century historical legacy. The strategic location of Jamaica and the safe harbours she provided gave the island added military importance throughout the eighteenth century and during the Napoleonic Wars. 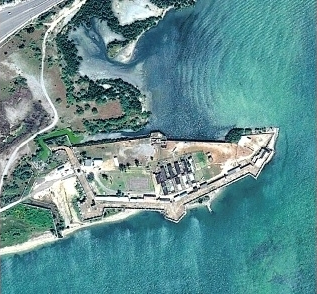 Funds for the building of forts were largely provided locally and voted by the Jamaican Assembly, and the labour was largely provided by slaves. Today this heritage is overseen by the Jamaica National Heritage Trust. 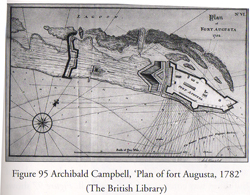 One fort that has recently been in the news is Fort Augusta, which was built in swampland to protect the western end of Kingston harbour, facing across to the remains of Port Royal and which despite huge earthquake damage in 1692 still also housed a military presence. Fort Augusta is notable both for the huge effort, and loss of life, that went into filling the swamp, and for its curtain wall of cut stone blocks. On three sides this is 1500 feet long, 42 feet thick and nearly 16 feet high. On the northern side a further 900 feet of wall six feet thick faces onto Hunts Bay. Once this eight acre fort would have housed large numbers of British soldiers and their supplies including gunpowder. In modern times it has housed a women’s prison. In 1763 the Fort Augusta gunpowder magazine was hit by lightning, killing 300 people and breaking windows up to seventeen miles away. Benjamin Franklin had already been involved in developing lightning conductors to protect such military installations from similar disasters, and had developed his lightning rod in 1749, but there is no evidence it had been fitted anywhere in Jamaica. The reason Fort Augusta has been in the news recently is because of plans to expand Kingston’s ability to handle container shipping. 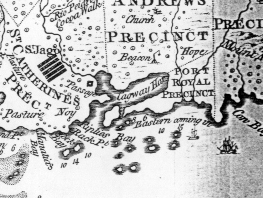 The container port is on the opposite side of Hunts Bay (now enclosed by the Port Kingston Causeway) from Fort Augusta. There is a classic conflict of interest between the needs of economic development and the benefits of preserving a nation’s history, highlighted in a recent letter to the Jamaica Observer. Fortunately assurances have been received that there is no intention to demolish Fost Augusta. Many places have found that by preserving their history alongside modern developments their cultural heritage is enriched and the economic benefits of the new development are enhanced. Let us hope this is possible in the case of Fort Augusta and that the development will bring a renewed interest in Jamaica’s history and appreciation of those who lost their lives creating it. Historic Jamaica from the Air, by David Buisseret with photography by J. Tyndale-Biscoe and cartography by Tom Willcockson, Ian Randle Publishers, Kingston Jamaica 1996. ‘First Catch Your Hare’ is one of those apocryphal quotations that was in fact never written, in spite of being repeatedly attributed to Hannah Glasse. 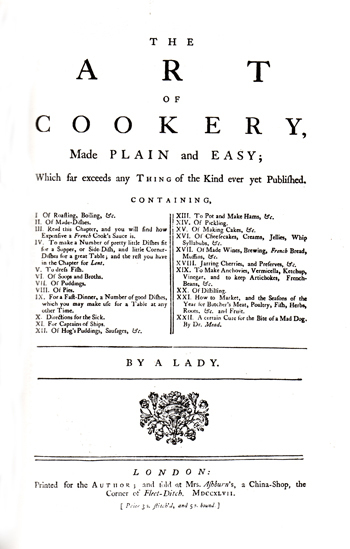 Hannah Glasse was the author of The Art of Cookery Made Plain and Easy first published in 1747, and although she is less well remembered than Isabella Beaton she pioneered the method of writing recipes in a systematic fashion that could be understood by anyone who could read. That her book sold so well gives the lie to the notion that all but the richest eighteenth century women were illiterate. In fact she was at the leading edge of the rise of the self-help book, something which would really take off in the following century with the introduction of steam-powered printing. Hannah was the illegitimate daughter of Isaac Allgood (of Brandon White House and Nunwick, Northumberland) and Mrs Hannah Reynolds. Her parents’ relationship ended after the birth of three children. Perhaps surprisingly Hannah then lived, not with her mother, whom she called a ‘wicked wretch’, but with her father and his wife, and she grew up close to her legitimate half-brother Lancelot Allgood. In 1724 her stepmother died suddenly and her father was in very poor health so she moved in with her grandmother Ryecroft in Greville Street, Hatton Garden. It was from here that she left in secret, aged just sixteen, to marry John Glasse at Leyton in Essex on the 5th of August 1724. A month later when her grandmother found out and threw her out, she and John Glasse moved to rooms above a chemist’s shop in the Haymarket. Over the next fifteen years Hannah bore eleven live children and suffered at least one miscarriage of twins. She corresponded with members of her father’s family in Northumberland and those letters provide most of the evidence for her life with John Glasse, who seems to have been largely without visible means of support and who died in 1747. By this time Hannah had already indulged in several money-making ventures including selling Daffy’s Elixir, writing her cookery book, and setting up a ‘habit warehouse’, a high class clothes shop in Tavistock Street. Quite how she managed it is unclear but among her clients were royalty, including the Prince and Princess of Wales. It was perhaps her bad luck that ‘poor Fred’ the Prince of Wales died suddenly, and possibly poor management or the unpaid bills of the aristocracy that led to Hannah’s bankruptcy in 1755. This resulted in the sale of the copyright of her book The Art of Cookery, in a story sadly very similar to the sale of the copyright in Mrs Beaton’s books a century or so later. Hannah went on to write The Compleat Confectioner and the Servant’s Directory but neither had the success of her first book. As with Isabella Beaton, Hannah Glasse did not invent her recipes, rather she plundered a variety of sources. It seems likely that although she had not had to earn her living as a cook and came from the gentry classes, that she actually enjoyed cooking. Although she took her recipes from other sources the main change she made was to provide precise measurements of quantities where none were given in the originals. She also gave very clear instructions and simplified much of the language that had been used in earlier recipes, for example changing ‘two right oranges’ to ‘two large oranges’, and instead of ‘lard them with small Lardoons’ she has ‘lard them with little bits of Bacon’. Where Hannah was not so systematic is in her arrangement of the recipes, there was no index in the first edition, nor are all recipes for similar ingredients grouped together. One fascinating aspect of her work is that it makes clear to us that many 18th century ingredients were a little different from now, for example eggs were generally much smaller, so if instructed to take a piece of dough the size of a hen’s egg it is well to remember this. Poultry too were smaller, but teaspoons appear to have been larger and she is probably referring to the caddy spoon used for measuring out tea rather than the smaller spoon for stirring a cup of tea. The Prospect Books facsimile of her book includes not only background to her family, but also detailed discussion of her sources, ingredients and methods of cooking. Here is a sample recipe chosen at random. I hope to post some more in future. It should be remembered that oysters in 18th century London were still commonplace and cheap. Whether the paper used over the breast was used dry or wet I am not sure. Take a fine large Fowl or Turky, raise the Skin from the Breast Bone with your Finger, then take a Veal Sweetbread and cut it small, a few Oysters, a few Mushrooms, an Anchovy, some Pepper, a little Nutmeg, some Lemon-peel, and a little Thyme; chop all together small and mix with the Yolk of an Egg, stuff it between the Skin and the Flesh, but take great Care you don’t break the Skin, and then stuff what Oysters you please into the Body of the Fowl. You may lard the Breast of the Fowl with Bacon, if you chuse it. Paper the Breast, and roast it. Make good Gravy, and garnish with Lemon. You may add a few Mushrooms to the Sauce. And if it seems as if Hannah Glasse’s story has an exclusively London bias, there is a curious postscript. For a document preserved at Nunwick Hall lists some of her surviving children, as of about 1767. Hannah the eldest was alive and unmarried, Catherine was twice widowed and had one son then living, Isaac Allgood Glasse was in Bombay, George who had joined the Royal Navy was lost at sea in 1761, and Margaret (chief partner in the habit making business) had died unmarried in Jamaica. This raises intriguing questions about why she was there. Clearly a good living could be made in London if her mother’s client list were exploited, so had she gone to Jamaica alone or with a brother? I have not been able to find a burial record for her, nor any other trace of the Glasse family, except perhaps an Edward Glasse who was in Port Royal, and who buried a daughter called Margaret there in 1741. Was he perhaps an uncle? First Catch Your Hare…The Art of Cookery Made Plain and Easy, by a Lady (Hannah Glasse), a facsimile of the first edition supplemented by the recipes which the author added up to the fifth edition and furnished with a Preface, Introductory Essays by Jennifer Stead and Priscilla Bain, a Glossary by Alan Davidson, Notes and an Index. Prospect Books, Totnes, 2012. ISBN 978-1-903018-88-0. The terrible earthquake that struck Jamaica just before noon on the 7th June 1692 changed the geography of the island for ever and set its progress back by many years. The timing of the earthquake was recorded by survivors but confirmed by the discovery of an early pocketwatch, made about 1686 by Frenchman Paul Blondel, during an underwater excavation. The watch had stopped at 11:43 am. Looking at this 1670 map and comparing it with one drawn nearly a century later, you can see that a huge area around Port Royal, notorious it is true for its pirates and brothels but nonetheless the centre for a lively trade with the outside world, simply ceased to exist. Port Royal was described as the wickedest city on earth, but mostly after its destruction when people were looking for an explanation and seeing it as God delivering a just punishment on a sinful people. About two thirds of the town of Port Royal disappeared in the quake, much of it because of liquefaction of the sandy soil on which the town was built. Brick buildings and wooden warehouses collapsed and slid into the sea. 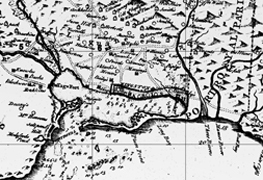 According to Robert Renny in his An History of Jamaica of 1807, “All the wharves sunk at once, and in the space of two minutes, nine-tenths of the city were covered with water, which was raised to such a height, that it entered the uppermost rooms of the few houses which were left standing. The tops of the highest houses, were visible in the water, and surrounded by the masts of vessels, which had been sunk along with them”. In the triple shocks of the quake the liquefied soil flowed in waves, fissures opened up and then closed again trapping victims as the sand solidified, some horrifically left with just their heads visible. In the tsunami that followed most of the twenty or so ships in the harbour were sunk or carried right over the town, and many who had survived the initial quake were drowned. The horror of the survivors at the huge number of corpses floating in the harbour was increased when they realised that many of these bodies had been washed out of the town’s graveyard. Looting began almost at once with the looters even hacking fingers off the dead in order to obtain their rings, and goods were stolen from the wharves and warehouses. The earthquake, which modern estimates suggest was about 7.5 in magnitude, was not of course confined to Port Royal. A huge landslip occurred at Judgement Hill. At Liguanea, the site of modern Kingston, the sea was observed to retreat 300 yards before a six-foot high wave rushed inland. Most of the buildings in Spanish Town were destroyed and serious damage occurred all across Jamaica. Worse was yet to come, for the survivors then had to endure a series of epidemics particularly of Yellow Fever. Perhaps 2000 of the 6500 inhabitants of Port Royal perished in the quake, many more died across Jamaica in the following few years. The island was over dependent on imported food and goods from England, and the disruption to its main harbour, loss of ships and warehousing brought about shortages of essential goods and reduced the ability to export. 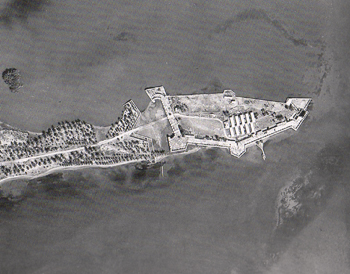 The Jamaican Assembly removed from Port Royal to Spanish Town and rebuilding began almost at once, but it has been suggested that the progress of the colony was set back by 20 years as a result of the devastation. Port Royal itself was so much reduced in area and further devastated by fire in 1704 that it never recovered. Two years after the quake Dr Fulke Rose, one of the early colonists who had been in Jamaica since at least 1670, returned to London with his family in order better to plead the cause of the island. He died there in March 1694 and you can read a transcript of his Will here. During the 1980s and 1990s underwater excavations took place at Port Royal which revealed much about life there before the quake struck. You can read about that project here. Jamaica suffers up to 200 earthquakes every year, most of which are quite minor, but the Earthquake Unit of the University of the West Indies at Mona describes the quake of 1692 as ‘perhaps our largest and most damaging natural disaster’.